With the benefits of assistance work being mentioned, why not incorporate some when trying to up your big lift numbers. The bench press is considered the king of the upper body lifts. 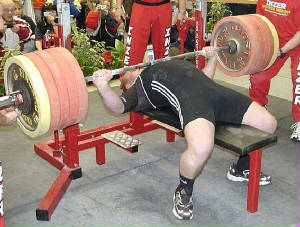 The primary muscles used in the bench press are the chest, shoulders, and triceps. The secondary muscles in the bench press would be the lats, and upper back. One of the main reasons people fail at the bench press is lack of strength in one of these muscle groups. Learn to strengthen one of these weak spots and your bench press poundage will increase. Let’s look at some assistance work that may be beneficial for your bench press. Below we will look at two exercises each for each of the primary muscles worked during the bench press. One of the best ways to add poundage to your bench press is by building up your triceps. However, I’m not talking about building them like a bodybuilder with a lot of reps and shaping exercises. 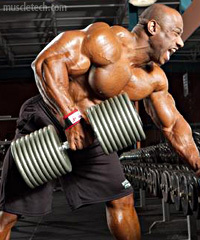 I’m talking about using heavy extensions and pressing movements that really hit the triceps. One rule of thumb when trying to build massive triceps for benching-stick to barbell and dumbbell movements. Floor Presses is a great exercise for building the midpoint of your bench press and tricep strength. 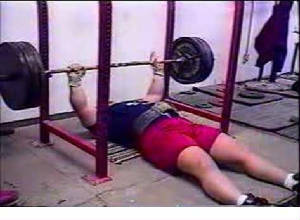 The exercise is performed in the same exact manner as a bench press except it is performed off of the floor. By doing them off of the floor you can only go a little more than half way down before your arms touch the floor. This range of motion forces you to use way more tricep strength when pushing. Once your arms touch the ground, pause for a second and push back up. Floor presses can actually be done with bent legs or straight legs. By using a straight leg version you do not get the drive from your legs like you would with a bent leg version. This makes the press a lot harder as the lack of leg drive makes it a total upper body exercise. This technique will also give you more overall power in the long run. By keeping the legs straight it makes the movement even harder with no drive from the legs!!! Tricep Extentions are monsters for building up massive tricep size. Not to be confused with the skullcrusher. While skullcrushers work well, the problem with them is sometimes they wreak havoc on the old elbow joints. One way to get the benefit of skullcrushers without the elbow pain is doing the tricep extention version. Start by lowering the bar down slowly and smoothly backwards towards your head. Make sure you are in control of the weight on the negative part of the rep.
Lower the bar to your forehead. Now drive the weight back up to the starting position. Start by lowering the bar down slowly and smoothly backwards towards slightly above your head. Make sure you are in control of the weight on the negative part of the rep.
Lower to the lowest point possible behind your head. There should be no discomfort in the joints. Typical Skull Crushers are lowered to the forehead. This is undesirable as it severely limits the range of motion and feels unnatural compared to this type of movement. Now drive the weight back up towards the starting position but instead of ending parallel to the floor you want to end about halfway between your head and parallel to the floor. The negative part of the rep should take about 2 seconds, and the positive about 1 second. The lowering of the weight behind the head provides a better stretch in the tricep and raising to a slight angle bellow parallel allows stress to stay on the muscle for a longer time and insures harder work by the triceps. Believe it or not the chest is often overlooked when trying to up the bench press poundage. People sometimes focus so much on building up their triceps and shoulders, they forget the bottom part of the bench press needs a strong set of pecs. The key here is to find exercises that can be used to put a good amount of work in on the pecs. Dumbbells movements are usually good choices cause they can allow for a bigger range of motion. 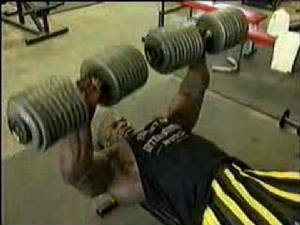 Dumbbell Presses are very effective for working the bottom part of the bench press. Dumbbells allow you to go lower on a bench press type motion than a barbell would. The key is to go low with the dumbbells and come up hard in a controlled manner. 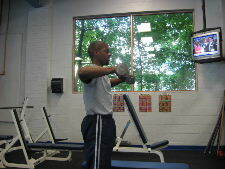 A second benefit is by woking with dumbbells you may correct some strength imbalances you have. 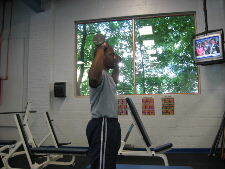 By using dumbbells instead of a barbell each arm has to work independently to push. 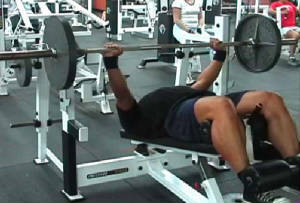 Decline Presses are great because they are great for strengthening the lower chest. This is excellent especially if you use an arch when you bench. The position you are in when decline benching also takes a lot of the shoulders out of the movement forcing the chest and triceps to work harder. Decline Presses also force you to bring the bar low on your pecs and the barbell over your elbows, the same position you want to be in when doing bench presses. You will never have a good bench without developing some good strength in your shoulders. Shoulders improve the mid part of your bench as well as help balance the bar during the lift. Shoulders are pressing muscles so the stronger you make them the better they transfer over to your bench press. Do your military presses standing. Remember your military press is supposed to be assistance for your bench press so do not overemphasize military press work. This is probably the only exercise on the list where I will not recommend you to train in a heavier fashion. This is a moderate weight moderate to higher rep exercise. These are for strengthening the often overlooked rotator cuffs. The rotator cuffs not only is probably the least mentioned parts of the shoulder area when it comes to the bench press, but probably the least mentioned area period. Heavy benching can take a toil on your shoulders over time and a good way to keep them healthy is by keeping your rotator cuffs healthy. Strong rotator cuffs not only help improve shoulder mobility but after a few weeks of working them watch your bench press improve also. The lats are sometimes forgotten when it comes to bench pressing because everyone focuses on the big three of the bench press-the chest, shoulders, and triceps. The lats may not be hit as hard as the big three but they play a pretty big role in bench press power. Your lats react as a spring when they are tight and pulled together. On the very bottom of a bench press this will give you “spring” to start your initial push. Big thick lats also give you more surface area to work with. The more surface are you have on the bench the better it is for your push. I don’t think I need to speak on the benefits of barbell rows for developing some nice thick lat muscles. Since we just went over the benefits of strong big lats to improving your bench press, you probably know where I’m going with this. Yes barbell rows will be beneficial to your bench press…long as you do them right. Let’s face it not all barbell rows are created equal. Depending on where you row is where you’ll get the most benefit. Row low to the stomach and you get much more lower lat work. Row high to the sternum and get more inner and upper lat work. For bench press purposes you want a bench press width grip rowing up to your sternum. Not only will this build lat meat where you want it but it teaches you to pull your lats like you would need to get that “spring” for bench pressing. The key to really executing this is to keep your elbows in to your sides and not let them flair out. Do them right and it should feel like the opposite version of benching. You want lats? Then you have to row, row, row, and then row some more. Dumbbell Rows will be one of your money exercises for that. Rowing motions work through the same horizontal plane as bench pressing. Be sure to try and pull back as far as you can with good form and pull more towards your chest. Today we looked at a few assistance exercises that may be beneficial in helping you up your bench press poundage. First we looked at a few exercises that would help improve strength in the primary muscles used when bench pressing. Then we looked at a couple of exercises that may benefit the secondary muscles involved in bench pressing. Assistant exercises are meant to be just that, exercises that help you in your goal to increase your bench press poundage. This means don’t hammer away at your assistance exercises so much that they start taking away from your bench press. The ultimate goal is to improve your bench press and these exercises are aids and not equals. If one of your assistant exercise numbers are going up but your bench press is not maybe you need to focus more on another muscle group. The true key to upping your bench is finding the weakness and improving upon it.